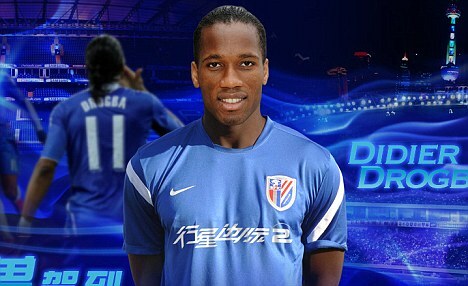 Former Chelsea striker Didier Drogba has signed with Chinese club Shanghai Shenhua on a two-and-a-half year deal. He will team up again at Shanghai with ex-Blues colleague Nicolas Anelka. Drogba had offers from a string of top clubs - believed to include Real Madrid - after leaving Chelsea on a free transfer last month. But he has decided to head to the Far East to see out his career at the same club as former team-mate Nicolas Anelka. The 34-year-old is expected to earn around £200,000 per week at his new club. The 34 years old Ivorian said: 'Today I can inform you that I have signed with Chinese club Shanghai Shenhua for a two and a half year deal. I will fly out to join up with the squad in July. "I considered all the offers I have received in the past few weeks, but feel Shanghai Shenhua is the right move for me at this time." Drogba joined Chelsea from Olympique Marseille for twenty four million in the summer of 2004, becoming one of Jose Mourinho's first signings. He helped the Blues to win three Premier League titles, four FA Cups and two League Cups during his eight-year spell. In that time he climbed to fourth on the list of Chelsea's all-time goalscorers with 157 and is also the club's leading scorer in European competition with 34. However, he decided to leave the Premier League club after their Champions League triumph.